If I try to login I just get this same page. I don't think I've done any manual configurations that would effect this as the last manual thing I did was install UPS packages. Can anyone give some direction? Thanks! Confirmed, I get this to. However, I still can't get past this. I've had some issues with the API which a restart of the service fixed. Still, has there been any other feedback on the WebGUI? I don't use couchpotato, but yesterday i was trying the develop branch to check the new gui, this i believe has being pushed to master just a few hours ago, i just pulled git, switched to master and the gui is still there, so this is a new change and staying apparently. Thank you for confirming this as well. So is it the plugin that's not letting me get past the login screen or a setting in OMV? or a setting in OMV? No idea, but is not omv, people have a misconception here. @subzero79, would you know the directory to do a git init or a git pull? 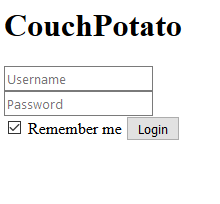 I went to /home/couchpotato/ and browsed the logs. The error log file is completely empty, and there's nothing condemning in any of the others. would you know the directory to do a git init or a git pull? Thanks, @subzero79, I ended up doing a clean install by uninstalling and reinstalling the plugin. This brought me to the CouchPotato wizard. However, after the setup process, I still couldn't get past the login screen... in Firefox. I switched over to Chrome and it logged right in (note that it would not log in via Chrome before the reinstall). So I would consider this resolved, but I'm still not sure what would cause it to hang in Firefox. Thank you for your help! Did you ever solve this? I'm having the same problem. 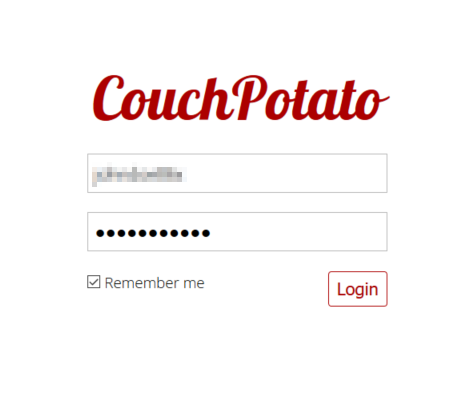 I found the settings.conf at /home/couchpotato/.couchpotato but am not sure what to do with it. Clear your cookies, then login, it's been working for me in Chrome. Before I cleared them I just kept getting the login screen over and over, even on a fresh install.